Shoeboxed Review-Tracking & Organizing Receipts Made Easy! If you’re like me, it can be almost impossible to keep track of your receipts. You put them in a desk drawer or in your wallet only to not be able to find them when you need them. You may never have heard of Shoeboxed, but it is a website that keeps track of your receipts for you. In this Shoeboxed review we will show you how it can make life easier. 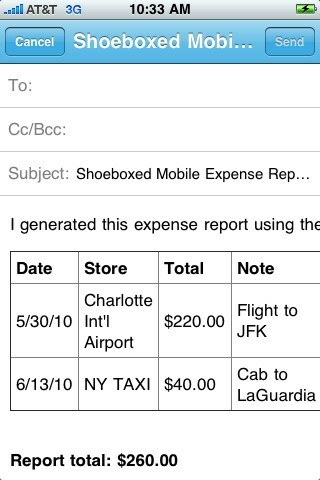 The Shoeboxed app for iPhones allows you to save your receipts right from your phone. It makes it easy to store a business dinner receipt without having to remember it later. When you visit Office Depot, you can save your receipt for office supplies right in the store. Get your FREE Version of Shoeboxed now! First register online and then download the free app on your phone. 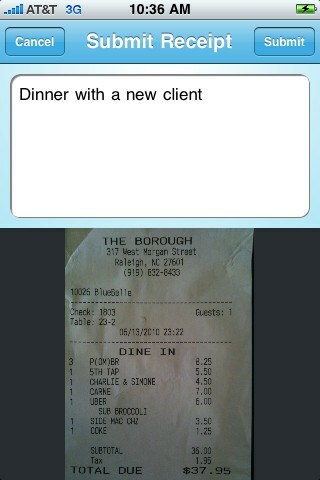 Once you download the Shoeboxed app onto your iPhone, you simply take a picture of any receipts you want to save. You can add a note for future reference and submit it to the website so they can extract the information. You will receive an email confirmation to let you know the receipt has been received. I was surprised by how easy the whole process was. They promise to have the receipt available within one business day for viewing. The item will show up along with other receipts on your main screen. The items are categorized by type of receipt so that it is easy for you to view. You can use this page to review your original receipt for warranties or to submit an expense report. One of the big benefits to using Shoeboxed is that it is accepted by the IRS. You can submit receipts saved online for your deductions on taxes. This is beneficial if you claim itemized deductions or are self-employed. The receipts are stored online in Shoeboxed’s document filing and management system, which is secure but available to you at any time. 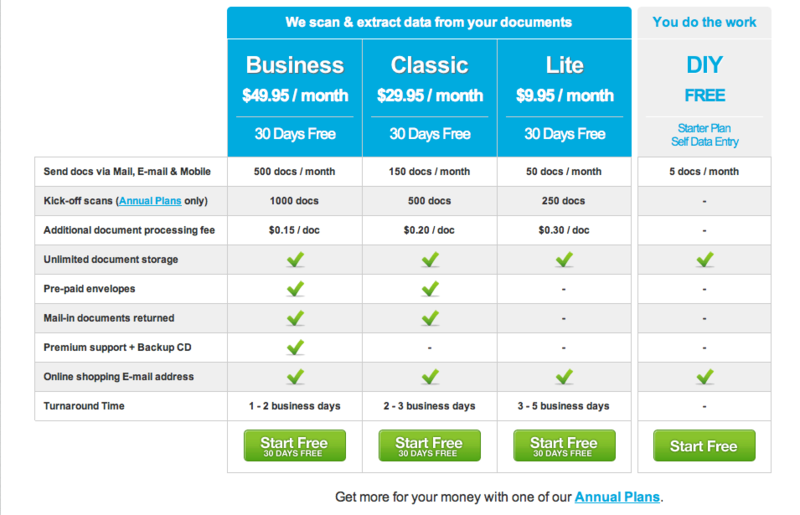 The receipts are easily converted to PDF, XLS, or CSV to make it easy to track expenses monthly, weekly, or even daily. This allows you to keep track how much you are spending in specific areas, can be great for budgeting. You can use it in your business to create invoices for your clients. You can integrate into Freshbooks, QuickBooks, or other accounting programs to save you time entering the same information twice. The basic app is free to download from iTunes. Once you have downloaded the app, you can choose the plan that suits you best. The DIY plan allows you to continue the service for free. You can upload as many images as you want as long as you extract all of the data. You can submit up to five documents from your iPhone for them to extract without additional cost. The other options are Lite, Classic, and Business plans with different costs for each. There are several differences between them, but the main one is the number of documents that can be submitted. If you’re like me have a lot of receipts and you don’t want to enter the information yourself, one of these plans would work great. I think the light version might be good for most individuals, if you are self-employed the Business plan can be very useful. If you go on an annual plan you can get 2 months for Free! All of the plans allow for unlimited storage so there is no worry of running out of space for your documents. All plans come with a 30 day free trial when your credit card will not be charged. You can scan up to 50 documents during this period. You are not bound by a contract and can upgrade or even downgrade at any time. You can also choose one of the annual plans to save even more money if you are fairly certain how many documents you will need to scan each month. You can store other documents on Shoeboxed besides receipts. I enjoy the convenience of storing business cards that I receive online. When you meet someone and they give you a business card, you don’t have to keep it with you. You can scan it to Shoeboxed and access it anytime you need to contact that person. It can be used like a mobile rolodex. You can also store your bills online with Shoeboxed. When you get a bill, scan it in and it will be readily available for your convenience. This allows you to check due dates from anywhere so that you pay bills on time. You can manage several clients with one account on Shoeboxed by using the Multiple User Accounts feature. It will let you track expenses and create reports for each client. Shoeboxed is a great app for stay-at-home moms, working singles, busy families, or self-employed business entrepreneurs. You will have the convenience of storing and organizing your receipts on your mobile device; it will save you time and money by accurately tracking and recording your expenses. The app has improved my record keeping in the short time I’ve been using it and with a free trial, you can’t go wrong. I was just about to buy neat receipts – now I need to rethink that. What about security – for downloading bills etc. I am so upset that I chose this company to keep my receipts. I was recently audited by the IRS, and had a terrible time getting the system to do a report and compilation of the relevant receipts, and then spent hours trying to the information sent to my email in a form that i could print to show the IRS. In fact, I finally had to call the company (whose mailbox is ALWAYS full, so you have to just catch them when they are in) and get them to run the report and sent it. Now, when my auditor has questions, the website is down and inaccessible, and I cannot answer any of her questions, which will cost me a fortune. It is a Friday, so there is no help line, and no way to get to my receipts. if you are just saving scraps of something for fun, use this service, but if you ever might need them, particularly in a hurry (like under two weeks), don’t use it. It has cost me everything.